(PRLEAP.COM) June 5, 2017 - President and CEO, Bill Kasko, of Frontline Source Group, Inc., has announced the addition of a new office in Atlanta, Georgia. The premier Texas professional temporary staffing agency and direct-hire placement agency announced the beginning of another major expansion plan to open locations nationwide with the opening of the new staffing office in Atlanta. The organization specializing in the placement of professional Accounting/Finance, Information Technology, Human Resources, Administrative, Clerical, Medical Front Office, Call Center and Oil and Gas professionals. Today, Frontline Source Group announced the opening of their 27th office. Kasko said, "The Atlanta office is an exciting time for both Frontline and the staffing industry. This expansion shows that job creation is back and we are excited to open this location in Georgia. We have a very aggressive expansion plan for 2017 and 2018 with up to ten additional locations throughout the country currently slotted. The additional locations are opening based on our client needs and our commitment to outstanding customer service." For more information about Frontline Source Group's services, visit Frontline Source Group's website and visit the new Atlanta Temporary Staffing Agency web page for up to date information. 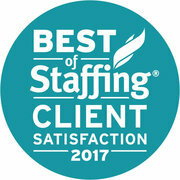 Established in 2004, Frontline was named Best of Staffing 2017 in both Client Satisfaction and Talent Satisfaction. This is the sixth time to participate and receive the award for Client Satisfaction and the third time to participate and receive the award for Talent Satisfaction. Frontline Source Group was also named to the Inc. 500/5000 List in 2013, 2014 and 2015 and named by Southern Methodist University (SMU) #76 as part of the Dallas 100. Frontline Source Group specializes in matching top talented professional candidates with companies for temporary, temp to hire and direct hire placement positions, primarily in the Accounting, Finance, Information Technology, Administrative, Customer Service, Call Center, Human Resources, Engineering, and Oil & Gas industries. Nationwide Staffing Services with Current Office Locations include, Texas: Dallas, Fort Worth, Arlington, Lewisville, Austin, Plano, Irving, Frisco, Garland, Richardson, Houston Galleria, West Houston, Downtown Houston, Katy, San Antonio, Sugar Land, The Woodlands; Tennessee: Nashville, Brentwood; Colorado: Denver, Denver Tech Center; Oklahoma: Oklahoma City; Arizona: Phoenix, Scottsdale; Illinois: Chicago; Georgia: Atlanta – Corporate office: Downtown Dallas.